If you’re looking for trawlers 40 feet and under, here are five to consider. There are many reasons we love trawlers big and small, and while trawlers are often associated with grand cruising plans, you don't always need a yacht-sized model to achieve your dreams of traveling to distant ports in comfort and efficiency. There are plenty of models under 40 feet that can take you places without depleting the retirement savings account. Here are a few top picks in the under-40-foot category. 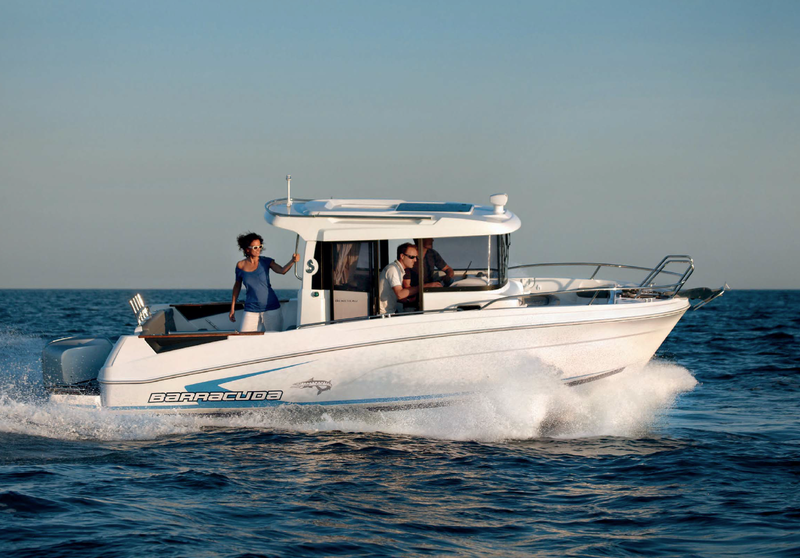 Cruisers looking for a small but competent option will want to see the Beneteau Swift 30. 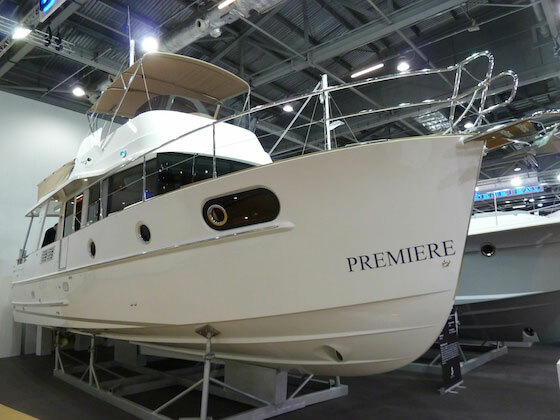 Beneteau has a rather extensive line of modern-designed trawlers in the Swift series, the smallest of which is the 30. It’s the epitome of a pocket cruiser, small enough to be both affordable and easy to maintain, yet it has the accommodations needed for extended living aboard including a full galley and a private stateroom. It also boasts a rather extensive flybridge for this size of boat with an upper station and a settee, plus a wide walkaround that can be accessed directly from the helm via a side door. 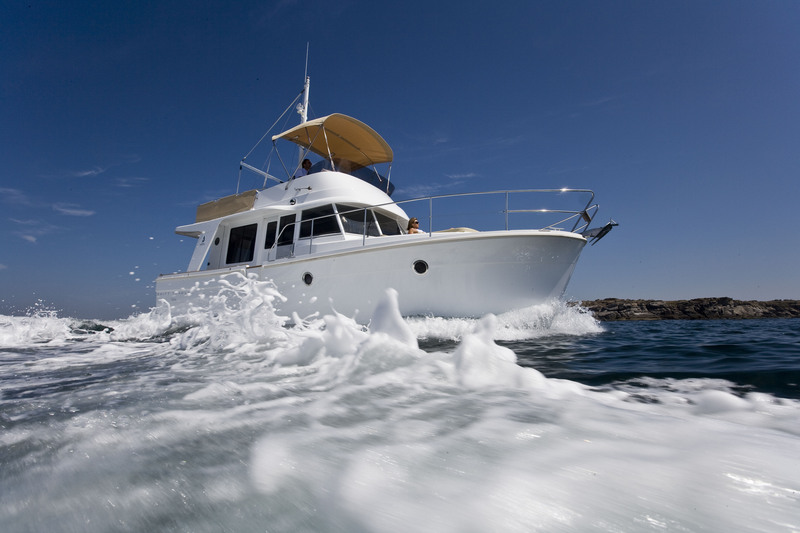 The Swift 30 also lives up to its namesake, with a top-end breaking 21 knots. Although fuel economy is a decidedly un-trawler-like one nautical MPG at this rate, pulling back on the throttles and travelling at a slow cruise of six knots nets you more like three MPG. Power comes courtesy of a single straight-shaft 370 HP Volvo D6 diesel inboard, and a 7.5 kW genset is optional. One unique perk is a swing-open transom, which opens the entire cockpit up to the swim platform. LOA is 32’9”, beam is 11’7”, and displacement is just over 13,000 pounds. 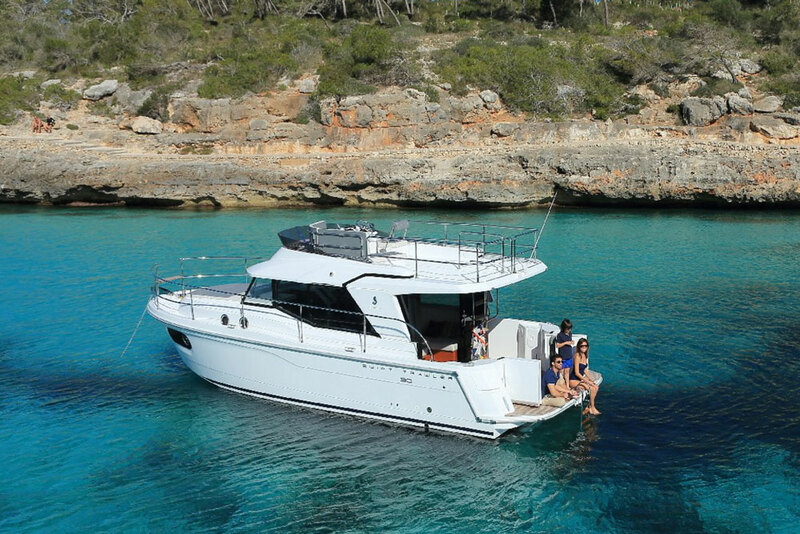 Read our full review, Beneteau Swift Trawler 30: Pocket Cruising for Couples. If you feel you need just a bit more LOA and you’re hip to going as green as possible, check out Shock and Awesome: Beneteau Goes Hybrid With a Swift Trawler 34. A Nordhavn 40 is the smallest trawler offered by this builder, but it still has ocean-crossing capability. Here’s a trawler under 40 feet (39’9” LOA, 14’ 6” beam) that has impressive cruising credentials. The Nordhavn has established itself as one of the most capable ships in its size range with both a circumnavigation and an Atlantic crossing under its waterline. 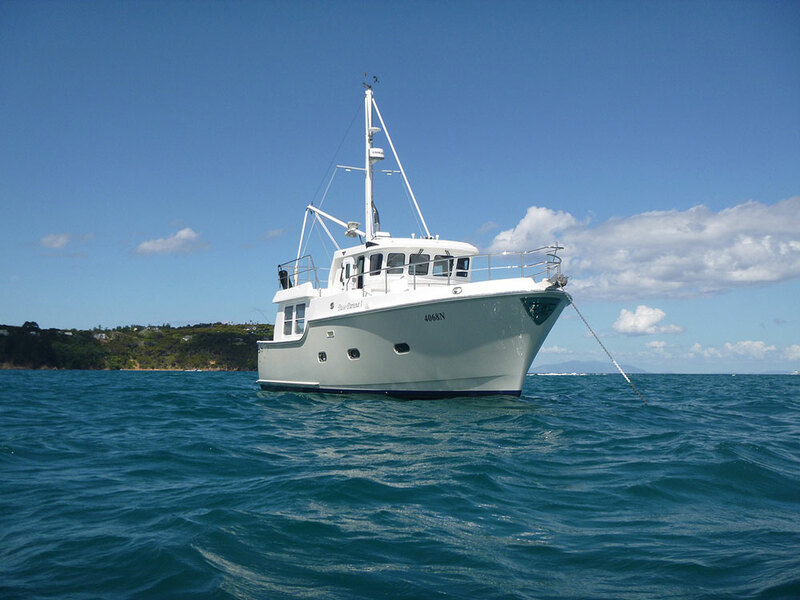 And the owners of this salty trawler are among the most serious cruisers you’ll meet. The N40 is the smallest model in the Nordhavn fleet of ocean-crossing motor vessels, so it has true offshore pedigree. It features a full displacement hull, a 900-gallon fuel capacity and range of 2,400 nautical miles at seven knots. Then there’s the seakeeping ability. The high bow is buoyant and makes for a dry ride, while a forefoot beneath the surface eliminates pounding. To further improve comfort for passengers, order a Seakeeper gyro-stabilization system which will minimize rocking and rolling in beam seas. The ride is just one benefit of the Nordhavn. So too is the way the builder engineered the layout to provide a number of social and private spaces, and for accommodations, there are two private cabins. Read our full review, Nordhavn 50: A Trawler that Goes the Distance. Unfortunately the 40 is no longer in production, but paying a visit to Nordhavn can give you a lot of insight into how these boats are built and what amazing cruising capabilities they have. If you want a pocket trawler you can trailer, the Ranger Tugs R27 is ideal. The Ranger Tugs R27 has been called one of the cleverest designs on the water because the builder managed to fit the necessities and many of the comforts of a larger cruising yacht into a trailerable package, while maintaining a comfortable ride. Yes it’s true, this trawler is trailerable; just look at the first picture in our Boat Towing Guide, and you’ll see that it can even be hauled by a relatively modest tow vehicle. Ranger Tugs is experienced at building small-but-capable boats, as we've seen in past models like the R31. The R27 is even smaller, though, (with an 8’6” beam and 27’1” LOA) perfect for a simple sunset jaunt through the harbor or overnight cruising. The bottom design is what you might expect in a semi-displacement vessel of this type, which is more displacement than planing boat. The hull has a keel that starts about a third of the way back from the bow, and then bulges slightly in the bottom to allow the Yanmar diesel to be placed lower in the hull, which makes the shaft angle only six degrees. While the boat can run in the high teens at WOT, if you throttle back to 13 or 15 knots, you could get a range on the order of 200 miles—which means you can travel for two eight-hour days between fuel stops. (Fuel capacity is 100 gallons.) Although it’s compact, engineers managed to free up 50 square feet of deck space aft. Cruising features include a V-berth and a midship berth, galley, dinette and head. This is one of the least expensive trawlers with such capabilities. Read our full review, Ranger Tugs R27: A Mini Trawler that Maximizes Space. See Ranger Tugs R27 listings. The American Tug's heritage includes both cruising and commercial fishing. The 365 is a relatively new design, but it’s based on the popular and proven American Tugs 34 from Tomco Marine Group in Washington. The inspiration for the 34 was an Alaskan fishing boat hull designed in the early 1980s by Lynn Senour of Seattle. To get commercial fishermen out to sea and home quickly, Senour created a boat with a wide beam of 13’ 3”. To increase the stability inherent in that beam and reduce roll, he added flat, sharp chines. The result was a fishing boat that could carry big loads and, with sufficient horsepower, scoot to fishing grounds and back to port. 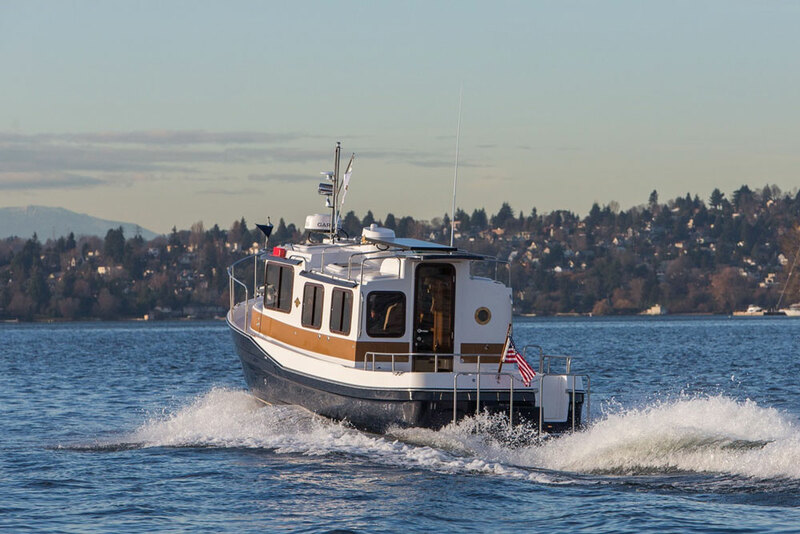 American Tug realized the design features that work for fishermen could work for recreational boaters, too, so they commissioned Senour to adapt that hull for their customers. The first American Tug 34 was launched in August 2000, and it found a loyal fan base. It’s evolved to become the 365, with features that enrich its mission as explorer-cruiser including a pair of panoramic windows in the salon. 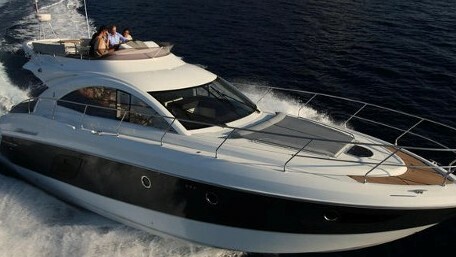 With an LOA of 36’ 6”, the 365 has two cabins and a convertible berth in the saloon. Power ranges from 330 to 380 HP. With a 370 HP Volvo top speed is 18 knots. 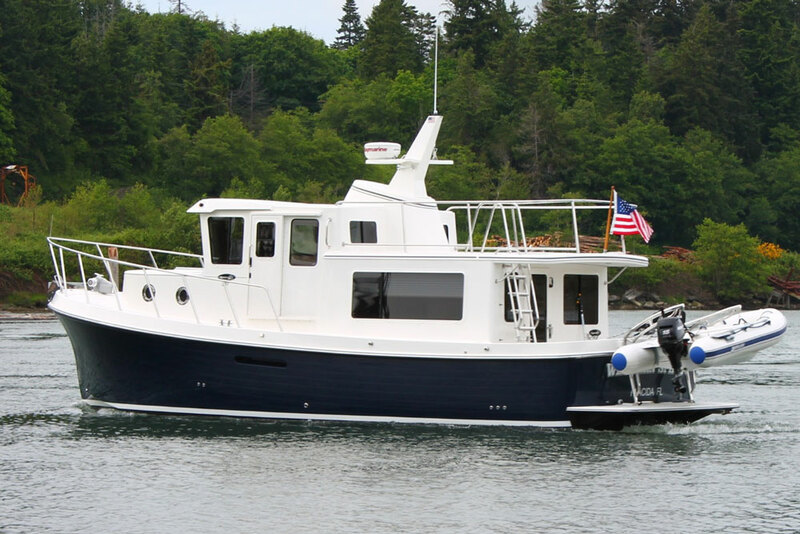 Read our full review, American Tugs 365: Cruising, Pocket Trawler Style. See American Tugs 365 listings. The Seapiper 35 is an affordable trawler that’s built for long-distance cruising, and can travel up to 2,000 miles despite its small size. The Seapiper has the appearance of the rather Spartan commercial fishing vessels trawlers were based on, and it’s designed with a similar mindset. Systems are barebones so they can be easily maintained by the owner, power comes from a single and simple 85 HP Betamarine diesel straight-shaft inboard, the galley has a two-burner propane stove, and there’s no exterior wood to maintain. 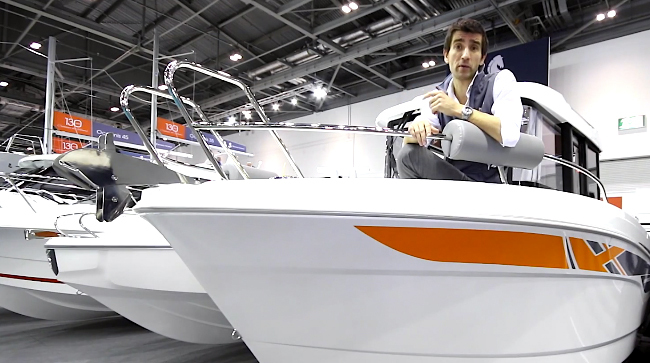 Aside from its no-nonsense attitude, the most unusual thing about this boat is its layout. The helm, settee, and galley are in the aft cabin. Behind it the tiny aft cockpit has just enough room for a pair of seats, but in front of the cabin there’s a 60 square foot open center cockpit with bench seating on the sides and engineroom access through the deck. Then forward of that cockpit there’s a separate second cabin, this one with a berth, stowage, hanging locker, and an enclosed head with shower. Matching the boat’s unique design are its unusual proportions; even though length is 35’0”, beam is a mere 8’6”. Putting all of these factors together you end up with an affordable trawler – MSRP starts at a mere $169,000 well-equipped – that is easy to maintain and can make long, long hauls at a very efficient fuel burn of one GPH, while going 6.5 to 7.0 knots. Read our full review, Seapiper 35 Review. Forty feet of LOA simply isn’t enough? 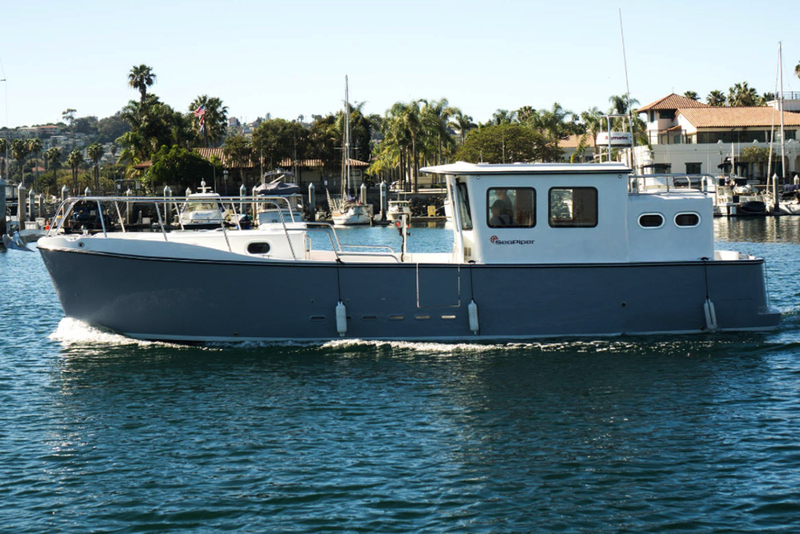 Then be sure to check out Five Affordable Trawlers Over 40 Feet. Editor's Note: This article was originally published in September 2013 and updated in August 2018.